On the 12th (Tue), stroll through Geoffrey Bay, then cast your line with a fishing tour, and then head off the coast to Magnetic Island Forts Walk. For reviews, maps, photos, and tourist information, use the Magnetic Island tour planner . New York City, USA to Magnetic Island is an approximately 33-hour flight. The time zone difference moving from Eastern Standard Time to Australian Eastern Standard Time (Queensland) is 15 hours. Plan for warmer temperatures traveling from New York City in March, with highs in Magnetic Island at 87°F and lows at 75°F. 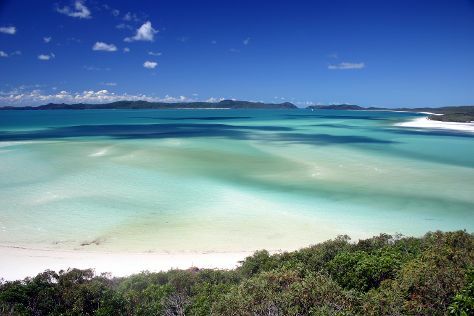 Wrap up your sightseeing on the 12th (Tue) early enough to travel to Whitsunday Island. Start off your visit on the 13th (Wed): stroll through Whitehaven Beach and then contemplate the waterfront views at Hill Inlet. To see reviews, photos, and tourist information, go to the Whitsunday Island route site . You can do a combination of ferry and bus from Magnetic Island to Whitsunday Island in 5.5 hours. Alternatively, you can do a combination of ferry and train; or do a combination of ferry and flight. March in Whitsunday Island sees daily highs of 85°F and lows of 71°F at night. Finish up your sightseeing early on the 13th (Wed) so you can travel to Hamilton Island. Start off your visit on the 14th (Thu): discover the deep blue sea with a scuba or snorkeling tour. Keep things going the next day: take in the waterfront activity at Hamilton Island Marina, then enjoy the sand and surf at Catseye Beach, and then head outdoors with Jetryder. To see more things to do, other places to visit, where to stay, and other tourist information, read our Hamilton Island trip planner . Use the Route module to find suitable travel options from Whitsunday Island to Hamilton Island. Expect a daytime high around 83°F in March, and nighttime lows around 75°F. Finish your sightseeing early on the 15th (Fri) to allow enough time to travel to Cairns. 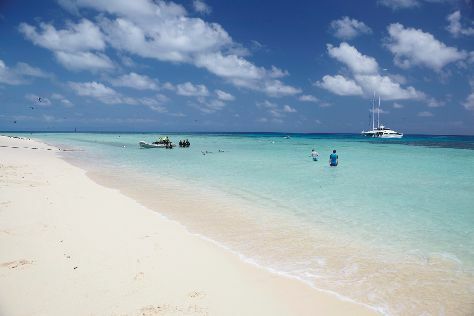 Start off your visit on the 16th (Sat): step off the mainland to explore Michaelmas Cay. To find other places to visit, where to stay, maps, and other tourist information, refer to the Cairns online road trip planner . You can fly from Hamilton Island to Cairns in 2.5 hours. Alternatively, you can do a combination of ferry and bus; or do a combination of ferry, bus, and train. In March, daytime highs in Cairns are 87°F, while nighttime lows are 74°F. On the 16th (Sat), wrap the sightseeing up by early afternoon so you can travel back home.